DeWalt expanded its FlexVolt System with an outdoor power equipment lineup that features a battery that automatically changes voltage when the user changes tools. The lineup will include a new chainsaw, handheld blower and string trimmer, which all feature the new FlexVolt 60-volt Max 3.0Ah battery—rather than the 9.0Ah used with the 20-volt Max tools. 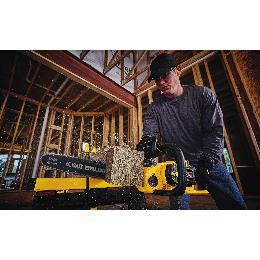 The 60V Max Chainsaw is equipped with a brushless motor, which the company said delivers performance equalling that of gas machines. The low kickback 16-inch Oregon bar and chain has auto-oiling designed for continuous lubrication and a tool-free tensioning system designed for quick bar and chain adjustment, the company said. The 60V Max Handheld Blower is also equipped with a brushless motor and clears debris at 423 cubic feet per minute and 129 mph. It also includes a flat concentrator nozzle to increase air speed to 175 mph. A variable speed trigger and lock allow for full-throttle control without constantly holding the trigger. The 60V Max String Trimmer features a 15-inch cut swath that accepts DeWalt 0.080-inch or 0.095-inch lines and a gear-drive transmission providing amplified torque that maintains cut speed. The line will be available in spring 2017.